Well, better late then never regarding updating this blog. this past summer, I didn't expect a poor urnout (maybe seven cars). As it turned out, we had 13 Reattas. 450-500 that would attend annually as recent as four years ago). In part the decrease in attendance could be due to the BCA national meet up in Portland. "Pebble Beach" worthy (re: Rodeo Drive car show which attracted a record crowd this past Father's Day), superficial Californians are not that interested. until they are 19 (I, among my closest childhood friends begged and groveled our parents to take us to the DMV on our 16th birthday). the next Reatta Rally. Until then, I'll see if anyone wants a mini Reatta Rally this fall. later than usual). I have finalized the Reatta Rally perks for the event - just hoping all goes as planned. in hits that site (and this Reatta Rally site) has received. What is (and is not) surprising is they don't reference the Reatta Division site within the BCA. 2015 calendar as it takes a lot of time to put together (but I haven't ruled it out). 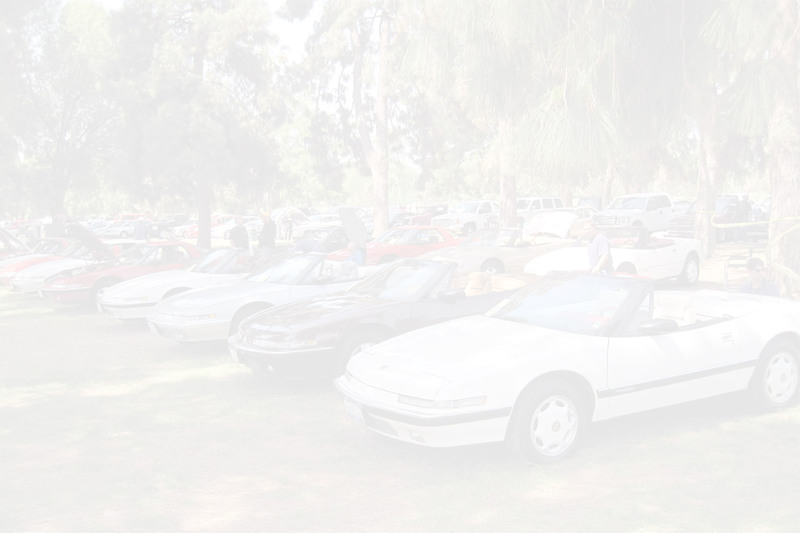 The display banner for the Reatta Rally is now in the July calendar on SoCalCarCulture.com. Registration form is complete and will be e-mailed to the Reatta Rally database by this weekend. Countdown clock to the day of event displayed on home page. all in the Reatta Rally database and posted on-line. January 3, 2014 - A belated HAPPY NEW YEAR! an e-mail with your thoughts using the contact link above. Putting the finishing touches on a mini Reatta Rally for November. Final details and an e-mail should go out early November. As requested, I am working on a mini Reatta Rally for October or November. It will be held on a Sunday morning. Further details to follow soon. The Reatta Rally had a very nice write-up on the Carscoops.com web site. You can read it here. about the Reatta Rally in a few days once I organize my thoughts and get some R&R. All things are a go! If you haven't mailed in your registration, bring it with you and register the day of the show. who attend The All GM Car Show register the day of the show) but I can't guarantee certain perks that others will receive who have already registered. I have received inquiries from New Zealand, Australia, Mexico, England and France regarding the Reatta Rally. Generally people want to know about the event and the car. (and the impact) the Internet has with reaching people. to know if there is enough interest and need to work on logistics. I added a link in the middle of the registration page (http://reattarally.com/reattarallyregistration.html) for information on accommodations in the area (can also be found here). Reatta Rally. I may have additional individual items to gift but most likely not the complete goodie bag. Reatta Rally is a few weeks away and time to put some things into gear. Swag (goodie bags) has been finalized. I'm working on a raffle give-away for Reatta Rally participants but not sure if the tooling can be done economically. I will be attending a couple shows this weekend to see if there are any ideas I can 'borrow' and utilize. Updated information for the 2013 Reatta Rally has been sent to all who have previously requested to be on the e-mail list (if anyone would like to be included, click here).